Much expectation is pinned on the November 14 space mission being taken out by the Indian Space Research Organisation (ISRO) at Sriharikota, weather willing. ISRO is readying itself to put communication satellite GSAT-29 on its heavy-lift vehicle, the GSLV-MkIII, in an evening launch on that day. The spacecraft as well as the vehicle are important to the space agency and its road map. Weather watch is a routine pre-launch activity for space agencies and especially so for ISRO around this time of the year. A senior official said mission managers were keeping an eye on the cyclonic buildup on the east coast in Andhra Pradesh, where the launch centre is located. ISRO is also preparing for a PSLV mission on November 26 to launch HySIS, a new variant of Earth observation satellites, along with 20-30 small commercial satellites. One significance of the GSAT-29 mission is that an Indian spacecraft will be flown after about seven months: the last one was the IRNSS-1I launched on April 12. For the other, it would be ISRO’s second communication satellite mission of 2018. It had launched another communication satellite, GSAT-6A, on March 29 but lost it in space a day later. The subsequent postmortems of the 6A mission and the recall of the 5,400-kg GSAT-11 satellite from Guiana before its launch have also pushed back ISRO’s ambitious plan to have a mission a month. A third factor weighing on Wednesday's mission: this would be only the second trial or developmental flight, D2, of the GSLV-MkIII or MkIII. On its success hinge many major future missions, including lunar lander-rover Chandrayaan-2 that is slated for January next year. Although there was a PSLV mission on September 16, the two small satellites on it were commercial Earth observation spacecraft belonging to a U.K. agency. The GSAT-29 satellite itself is one of the planned Indian HTS quartet. The HTSs or high throughput satellites are being sent out to provide a vastly improved and faster Internet connectivity. GSAT-19, the first of the series, was sent up in June 2017 from Sriharikota. 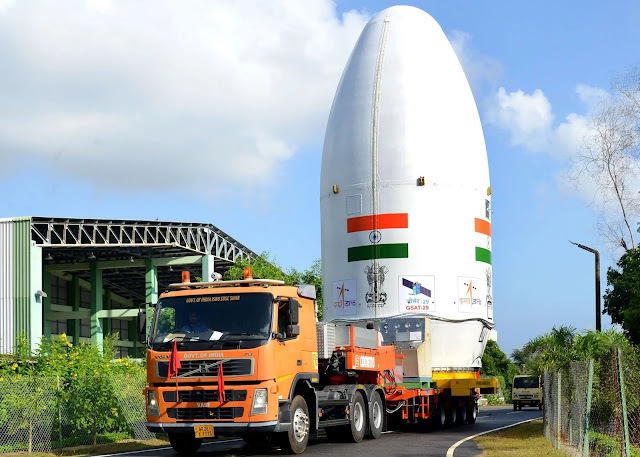 The third and ISRO’s heaviest to date, GSAT-11, awaits a scheduled launch on December 4 on a European space vehicle, Ariane-5, from French Guiana. GSAT-11 was brought back from French Guiana to Bangalore in April this year for additional tests and was re-transported last month for a confirmed launch. ISRO had later said it did not want to take risks with such an advanced and costly satellite as GSAT-11 — put at 1200 crore including the launch fee of Arianespace. Thus the November mission should also put many of ISRO’s satellite-related apprehensions to rest.